Fluorescence spectroscopy continues its advance to more sophisticated methods and applications. As one looks over the previous decades, its appears that the first practical instruments for time-resolved measurements appeared in the 1970's. 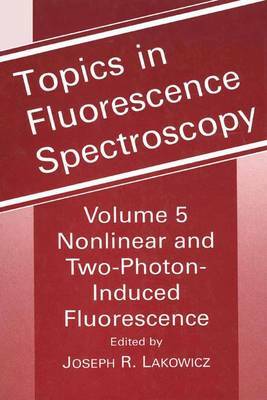 The instrumentation and analysis methods for time-resolved fluorescence advanced rapidly throughout the 1980's. Since 1990 we have witnessed a rapid migration of the principles of time-resolved fluorescence to cell biology and clinical appli- tions. Most recently, we have seen the introduction of multi-photon excitation, pump-probe and stimulated emission methods for studies of biological mac- molecules and for cellular imaging. These advanced topics are the subject of the present volume. Two-photon excitation was first predicted by Maria Goppert-Mayer in 1931, but was not experimentally observed until 1961. Observation of two-photon excitation required the introduction of lasers which provided adequate photon density for multi-photon absorption. Since the early observations of two-photon excitation in the 1960s, multi-photon spectroscopy has been limited to somewhat exotic applications of chemical physics, where it is used to study the electronic symmetry of small molecules. Placing one's self back in 1980, it would be hard to imagine the use of multi-photon excitation in biophysics or cellular imaging.